For nearly a century, the Littleton Community Center has welcomed an estimated two million people through its doors. The Queen Anne mansion, formerly owned by a North Country lumber magnate, was purchased by the town following WWI. The idea, hatched by local prominent residents, was to create a living monument to the fallen soldiers. What really makes the cars on Main Street slow down, though, was the removal of the 1970s vinyl siding. In 2016, the vinyl came off, the clapboards and shingles were repaired and replaced where necessary, new storms were installed, and a historic paint scheme was selected. 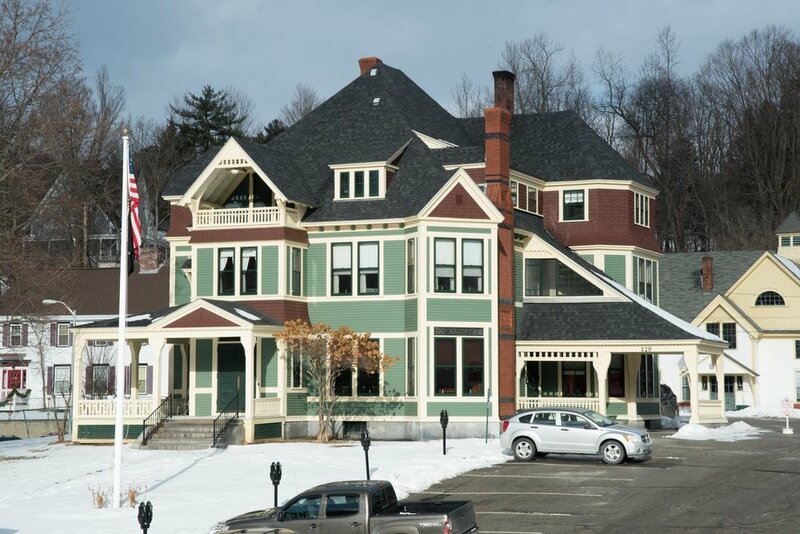 The LCC board is now implementing a strategic plan, which includes an LCHIP-funded study on the carriage house and surveying the public about needs. A spring 2017 survey revealed that 67% of respondents felt that the preservation of the building was a top priority. Next time you're in Littleton reveling at Main Street's success, make sure to step inside the Community Center. There, revel at the house's beautiful interior woodwork and pay your respects to Littleton's fallen soldiers. But don't mourn for the vinyl siding.